Andy Warhol’s portrait of Marilyn Monroe was taken from a publicity still of her 1953 film Niagara. This portfolio is one of ten screen prints produced on paper and published as an edition of 250 each. Marylin Monroe 26 by Andy Warhol is one of the most vibrant of the set. The colors and the iconic subject encapsulate the pop art movement Andy Warhol founded. Andy Warhol Marilyn Monroe 26 (1967) from Marilyn Monroe series 22-31. Andy Warhol’s interest in the commoditization of pop culture lead to different techniques in the creation of reproductions. Warhol played with variations of color and composition of a single image to produce limited edition prints. The portrait of Marilyn Monroe 26 is from a publicity still of her 1953 film Niagara. This portfolio is one of ten screen prints produced on paper and published as an edition of 250 each. Marylin Monroe, alike Andy Warhol, is one of the most infamous figures of pop culture. Marilyn represents the glamour, charm and iconic status that Andy Warhol loved in his subjects.In the 1960s, Andy Warhol created many “mass-produced” images from photographs of celebrities such as Marilyn Monroe, Elvis Presley and Jackie Onassis.Warhol was inspired to experiment with silkscreen printing, thus bringing together art and commodity culture. Andy Warhol’s usage of Marilyn Monroe’s image directly after her suicide is a testament to the twisted nature of Warhol’s work. Andy Warhol made beauty out of tragedy, and tragedy out of beauty. Andy Warhol’s Marilyn Monroe images capture the pop art essence: to bring popular culture into the household as art, as a critical comment on traditional fine art values. Andy Warhol understood the fun draw of modern culture. No one was more fun or modern than Marilyn Monroe. However, Even as Warhol canonizes Monroe, he reveals her public persona as a carefully structured illusion. By repeating Monroe’s image (and that of other celebrities) over and over again, Warhol acknowledged his own fascination with a society in which personas could be manufactured, commodified, and consumed like products. 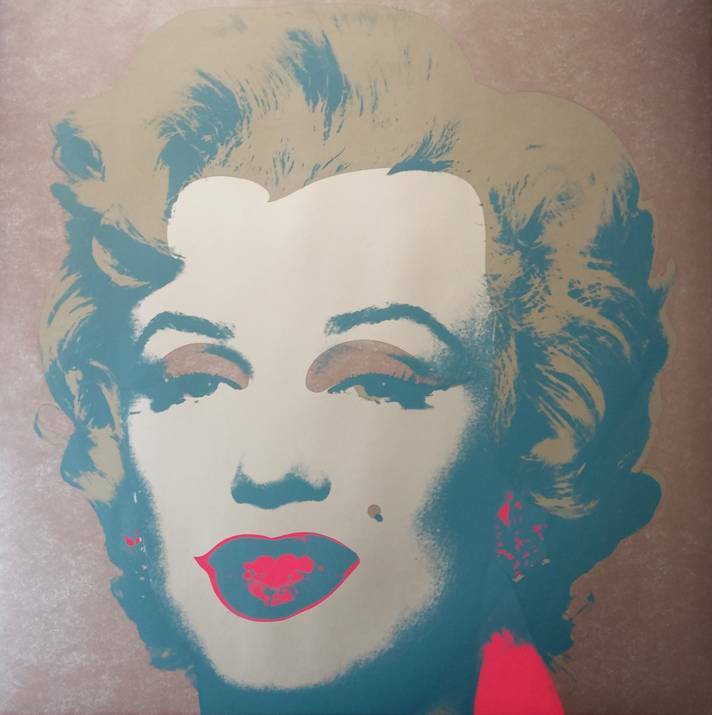 Marilyn Monroe 26 comes in sharp bright pink and yellow.The bright colors and the usage of Marilyn Monroe as the subject encapsulate the pop art movement Andy Warhol founded.